Amigapd would like to thank Graham Humphrey for taking time to answer some questions about his new work in progress game Downfall and his views on public domain games and the amiga scene in general. Hope you enjoy the interview. _How did you first become involved in game development / programing? _The idea of making my own games was something I'd always been interested in but it wasn't something I could ever get my head around, being a bit too young at the time. But I remember buying a boxed and complete copy of Blitz Basic 2.1 off Ebay when I was 14 for £3.50 – a real bargain and I think it's fair to say I've had my money's worth. At the time, I only had a bog-standard A1200 (as far as Amigas were concerned, anyway) so I was limited in terms of what I could do, but I spent some time, on and off (mostly during school holidays) just messing about with it. I found it tough going and tried a couple of times to write full games without any idea of what I was doing and inevitably it didn't come off. But I became more and more interested in learning and when my GCSEs had finished, I spent a lot of time downloading source code for programs other people had written and studying them closely to learn how it all worked. I suppose it all took off from there and I started making genuine progress. _ How many games have you made for the Amiga and how many were released to the public? 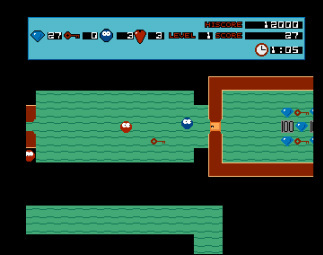 So far, I've only ever finished three projects – the first one was called Blobz (not to be confused with an obscure late commercial release), which is an overhead-viewed affair in which you have to collect all the gems on the level and reach the exit within a time limit. I wrote this when I was 17 and released onto Aminet in early 2004. To be honest, it's a bit naff – not only is it horrendously inefficient with resources, a lot of the level designs leave plenty to be desired and the code is a sprawling, untidy mess. I was really pleased at the time though – I'd written and released an entire game all on my own. If I reviewed it today I'd give it a kicking as it's rubbish. But it's well-intentioned, enthusiastic rubbish. My second completed effort was a flip-screen platformer called Diamond Kingdoms. This came into being just over a year after Blobz and again was a diamond-themed production (believe it or not). It contained ten levels and had much the same goal as my first game, only with coins to pick up for extra bonuses and plenty of secret bits to uncover. Again the actual programming was hardly silky-smooth and my lack of graphical ability really showed up here – I nicked a lot of enemy sprites and objects from other games but it just served to make it look even odder. It still wasn't that good and I'd give this one a kicking too. Despite that there was interest in giving it a physical release but it never happened – not that the finished product justified it. I never bothered releasing it in the end, but I might go back and re-write it one day so it's fit for a release. Finally, Tank Wars followed in 2006, and was written from scratch in the space of about three weeks. I feel this is the most enjoyable of my games as it's a simple, no-nonsense multi-player title that does what it says on the tin. There's 25 different maps to battle on and a league mode to add an extra edge. It's very basic but I think it works well (even if I do always lose). Certainly Retro Gamer magazine thought so when they reviewed it in issue 31 (if my memory serves me correctly), awarding it a mammoth 85% and pointing out that the power-downs, as well as the traditional power-ups, added a different dimension to the game. As you can imagine, I was really happy with that one. Since then, I've not written a finished game. I've had a few ideas I've played around with here and there but I've mostly lacked the motivation and discipline to really get into it properly (until now, that is). I kind of regret it in a way – it's been almost six years since I completed something and that's a long time. If I stuck with it I think I could have written a few more games in that period. But if you're not enjoying it and lack the desire to do something worthwhile then you may as well not bother. That's coming back now, though, and I'm hopeful I will have something to show for that sooner rather than later. _What were the main reasons for games not being finished? Would you ever make these games available to the public? _It's very easy to bite off more than you chew when it comes to games development. I think the best example of this is Annihilation, a horizontally-scrolling shoot-em-up I worked on, on and off, over a three-year period before finally calling it a day in 2008. It had a lot of potential, but ultimately I had too many ideas above my station. And when other people start saying “wouldn't it be great if...”, you can end up with a massively unworkable project that you'll never get a chance to finish. I felt bad because a lot of people had given me plenty of support in terms of graphics and music, as well as playtesting and general feedback, but I knew I wasn't capable of doing the game justice. The source code is a bit shambolic but if anyone wants the files to play with they can have them. Another one that I started in 2008 was Tank Wars Deluxe. 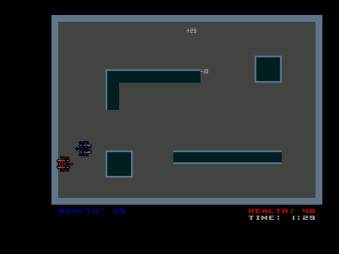 This was intended to be an upgrade of the original, including double the number of levels, new graphics and new Deathmatch (where players get points for kills and respawn until the time limit runs out or a certain score is reached) and Thief (like Deathmatch, but tanks leave coins behind when they die and you have to pick the coin up to score a point) modes. Most of the additional programming was done but the whole project just petered out, simple as that. I might have a go at finishing this off in the future if enough people decide they want it. Also, I've had several ideas floating around that simply turned out to be rubbish. Thankfully I don't waste too much time on these as I spot fairly early on that there's simply not going to be anything decent at the end of it, even if I was able to finish it off. It's very hard to enjoy creating something when you know deep down that it isn't going to cut the mustard. Tank Attack was a 2 - 5 player game - why was there no single player option? _ Basically, because I lacked (and indeed, still do lack) the ability to program any sort of AI at all, let alone one that could do a passable impression of a rubbish games player. And anyway, that sort of game isn't much fun in one-player mode – it really is the sort of thing you play when you have your mates round and you've got a few drinks in. And you can never have too many of those (games that is, not the drinks. Although...). What made you use blitz basic rather than Amos? You are involved with reviewing games for Amiga Future magazine - are there many Amiga games under development we can look forward to? _When you are reviewing a game what do you look for and what makes a good game? When you are reviewing a game what do you look for and what makes a good game?When you are reviewing a game what do you look for and what makes a good game? _Quite simply, the most important thing is that the game is enjoyable, which sounds obvious but you'd be surprised how often this is overlooked in favour of trying to appear clever. I've seen plenty of titles that have been very well put together but there's not a lot of mileage in the actual concept. There have also been some rather interesting ideas that have not had their full potential exploited. You need both sides of it for the game to work as well as it should. Sadly there haven't been many new releases in the last few years that have achieved this. Of course, you have to take into consideration that the people behind these games are just enthusiasts programming in their spare time and it's not like they're asking for any money for these, so it's important to be constructive too – but it's still frustrating when it's obvious that some people can do better. Not only that but the playtesting can be lacking too. It's important that the gameplay is well-balanced, fair and the player feels suitably rewarded when he/she does something right. The newest version of Alien Fish Finger is an excellent example of this – it's been fine-tuned almost to perfection and it shows from start to finish. As long as you have this then anything else like the standard of graphics and music is a bonus. _Some gamers tend to ignore PD / shareware games thinking they are poor quality compared to their commercial rivals - do you think this view still exists or has there been a change over recent years? _I think you'll always get people who have this mindset – that if a game wasn't made by a professional development team with a big budget then it can't be any good (which is strange as that's surely the last thing fans of retro machines should be concerned with) – but equally I think there are plenty of Amiga users who do recognise how good some of the games are. I think magazine coverdisks back in the day were a great help. Before the internet became mainstream, you'd rely on their disks for playable demos of the latest titles, but also you knew you'd get plenty of interesting PD games too. Sometimes they were worth the price of the mag on their own. Amiga Power in particular stuck some real classics on the cover, more so towards the end of its run when commercial releases became thin on the ground. But even in the computer's heyday, plenty of PD and Shareware titles became famous thanks to the magazines covermounting them. I suppose that these are the games that remain the most popular simply because they were easily accessible to people – after all, if you had a magazine like CU Amiga or Amiga Format deciding to feature your work on their cover at the time when they were both selling well over 100,000 copies a month, people are bound to take notice. I suppose in some respects it's a lot harder these days for PD software when you can download almost every single Amiga game ever released (and some that weren't) with just a click of a mouse button. The more clued-up users will always appreciate the importance, depth and quality of free software however, and there's a large number of titles that are of the same standard as professional efforts, if not better. _Which shareware / public domain games would you recommend to individuals new to the scene? If you're just starting out then the more well-known games are an obvious place to begin. Following on from my comments about PD games being covermounted at the height of the Amiga's popularity, you'd do well to check out titles such as Drip, Megaball, Cybernetix, Pod, Deluxe Galaga, Scorched Tanks, Atom Smasher, Crazy Sue and Super Obliteration to name but a few. I would stress, though, that there are some absolute gems hidden away on sites like Aminet, from all sorts of genres – the diversity of games on offer would surprise a lot of newcomers. As a case in point, if you take the period when the Amiga was all but dead as a commercial platform (around 1995-96) it was probably something of a golden age for PD. Alien Fish Finger got its original release then, but if strategy games were more your cup of tea, Breed '96 would have suited you down to the ground. Knockout 2 and Sneech were both absolute riots if you fancied getting your mates round for a few games yet they couldn't be more different. If there were only two of you, you could still lose hours falling out with each other over Super Foul Egg or famous Thrust-alike Gravity Power. If you liked that sort of thing but didn't have another human being handy, R3 was just the ticket, whilst if you preferred something that would simply melt your brain, the unique Springtime was certainly worth a look. And this is just scratching the surface (I've not mentioned, for instance, Superballz, Alien Bash 2, Speed Racer FX or Tennis Champs yet, off the top of my head). There's just so much to discover so I would encourage anybody to try anything they can get their hands on – you never know what you might find. _You have started a blog about your new game downfall - how is it progressing? _I'm pretty satisfied with the current rate of progress. I've had some neat graphics drawn for me which is one of my biggest obstacles removed early on. Every time I go to work on it, I've always solved a problem or added a new feature, even it's relatively insignificant. At the time of writing, the game is in a very basic state but you can actually play it and there are no game-breaking bugs in the code (touch wood). When the major elements of the game are finalised the rest shouldn't be too taxing to polish off – but as I'm working on this project in my spare time, I can't promise a final release date. But there's a bit more to it than that. For those readers who aren't familiar with my aims, not only do I want to produce a complete game, I'm also including the full commented source code with each new version in an attempt to try and get more people involved in making Amiga games, or failing that, getting them to contribute to mine. This already appears to be working to an extent as I've had a couple of people get in touch telling me my work has inspired them to either start or get back to programming. And, of course, I've got others helping me out with graphics and sound. If things continue in this manner then it can only be positive for the Amiga scene as a whole. It would be brilliant if we had more new games and I can only hope this is just the start.I'm pretty satisfied with the current rate of progress. I've had some neat graphics drawn for me which is one of my biggest obstacles removed early on. Every time I go to work on it, I've always solved a problem or added a new feature, even it's relatively insignificant. At the time of writing, the game is in a very basic state but you can actually play it and there are no game-breaking bugs in the code (touch wood). When the major elements of the game are finalised the rest shouldn't be too taxing to polish off – but as I'm working on this project in my spare time, I can't promise a final release date. But there's a bit more to it than that. For those readers who aren't familiar with my aims, not only do I want to produce a complete game, I'm also including the full commented source code with each new version in an attempt to try and get more people involved in making Amiga games, or failing that, getting them to contribute to mine. This already appears to be working to an extent as I've had a couple of people get in touch telling me my work has inspired them to either start or get back to programming. And, of course, I've got others helping me out with graphics and sound. If things continue in this manner then it can only be positive for the Amiga scene as a whole. It would be brilliant if we had more new games and I can only hope this is just the start. Are there any 8 bit games you wish had been updated for the Amiga? _Funnily enough, I can't think of that many. One I was going to mention was Jet Set Willy but even that got some excellent PD updates in the form of Jet Set Willy '97 and Willy's Weirdy Nightmare. Other than that, I'd like a decent version of Jetpac, and I also wish we got the original Dizzy just to complete the set. I think we're fortunate that even if old 8-bit games got lousy official updates (if any at all), PD authors usually came to the rescue with superior efforts. What advise would you give to individuals who are considering to write their first game for the Amiga? _Assuming that you're enthusiastic and are willing to dedicate the time and effort necessary to undertake such a task, start with a project that is relatively small, just so you have a realistic chance of finishing it. Particularly when you're just starting out, there is nothing as disheartening and daunting as setting yourself absurdly ambitious goals and this has been the downfall (no pun intended) of many a project. We all dream of producing a classic but there's no point trying to run before you can walk. You also have to be persistent. If you're a rookie then you have to accept that at various points things won't go as smoothly as you'd hoped, but that's all part of the learning process. No matter what language you opt for, there are plenty of helpful, supportive people about who can assist, and finding examples of code written by other people can prove useful – as long as you eventually understand what the code is doing. It can be beneficial messing about with source other programmers have written and picking things up by trial and error. Above all else, though, you really have to enjoy it. If you lose the enthusiasm when it starts to get tricky, then you need to take a break or pack it in altogether if you're not feeling it at all. Otherwise you're just wasting your own time and it won't make for a good final product (if you make it that far). What is the best thing about being involved with the Amiga discussion boards? Only one thing? I'd have to say the sheer number of people with such diverse interests and areas of expertise under one virtual roof. They're such an excellent resource of knowledge and opinions that anyone who doesn't at least make the occasional visit is seriously missing out. On top of that, it's usually friendly, welcoming and a lot of fun, so I'd encourage everybody to get involved in some capacity. My own favourites are the English Amiga Board and Lemon Amiga (but in the interests of fairness, I ought to point out that other sites are available). _ Is the Amiga following healthy across the world or are their particular countries which are more active? _I'd certainly say Europe is the main hub of Amiga activity. Of course, North America, along with Australia and New Zealand, certainly have a strong contingent, but the vast majority of active Amiga fans are European by the looks of things – the UK and Germany have big numbers, Poland isn't far behind and the Scandinavian countries are well represented too. This is purely in my own experience and opinion however so do take it with a large pinch of salt. If you could interview one Amiga programmer who would you chose and why? That's an extremely good question and one that's had me thinking for some time. 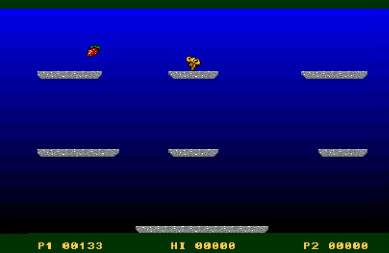 After some careful consideration, I'd have to say Andrew Braybrook of Graftgold for some quite frankly phenomenal programming – he was responsible for the Amiga conversion of Rainbow Islands, after all. Not to mention superb titles such as Fire & Ice, Uridium 2 and Virocop. I'd love to know how he pulled some of those out of the bag – technically a lot of his games really are excellent. There was some serious talent on display there and he knew a thing or two about game design as well. I don't think too many people in the industry (past and present) can boast a CV as good as his and it would be fascinating to discover what went on behind the scenes. AmigaPd would like to thank Graham for taking the time to answer the questions and wish him all the best with his future project. To find out how Downfall is progressing please visit his blog on the EAB forum. You can also download the work in progress version of downfall from the Downfall Website.